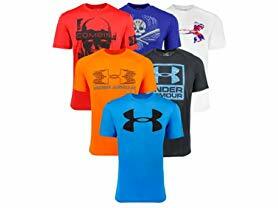 Today ONLY - Under Armour Women's, Men's and Boy's Assorted Fitness T-Shirt 3-Pack $29.99 - $34.99. The highest quality T-shirts Under Armour has to offer. Enjoy this random color 3-pack for yourself or get it as a gift for a family member or friend. Bundles will include UA Tech, Twisted Tech, UA Tech Space Dye, UA Flyweight, UA Big Logo and many more.